Paris Couture Week always offers an array of swoon-worthy gowns to lust over. 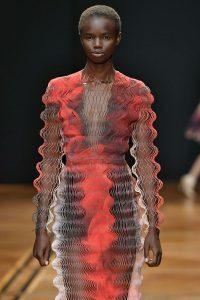 But yesterday, Dutch designer Iris van Herpen lit up the runway with a little more than just artful dresses. Inspired by celestial maps, astrology, and outer space galaxies, the designer tapped into a futuristic world defined by 3-D printed face jewelry and glow-in-the-dark heels. The latter made for an epic grand finale at the brand’s Spring 2019 Haute Couture show. Standing out as the pièce de résistance of the galactic-infused collection was a sea of transparent plexiglass heels that lit up in the dark. According to Times reporter Elizabeth Patton, the shoes took a total of four days to create and were infused with two colors of ink, then carved by hand into undulating curves. The end result is a glowing heel reminiscent of the light-up sneakers you begged your parents for as a kid. Along with the glow-in-the-dark heels, the collection’s dresses looked to other cosmic forces as sources of inspiration. 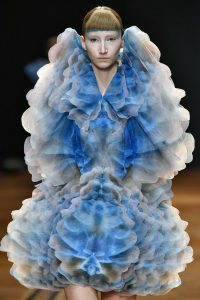 A series of voluminous, cloud-esque gowns were inspired by artist Kim Keever, a former NASA engineer whose work merges painting with photography. Other sculpturally-shaped looks offered a similar effect, featuring 3-D lasercut detailing meant to give the illusion of mythological creatures. 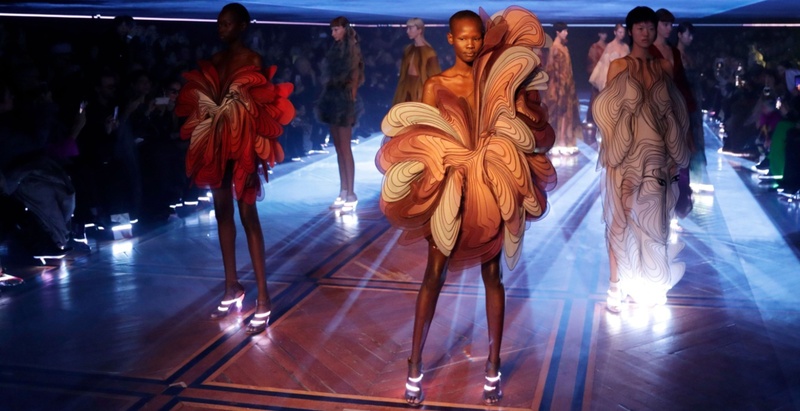 During a time when most designers are looking to previous decades for inspiration, van Herpen is looking onward to new galaxies. It’s time to bring back the glamour.